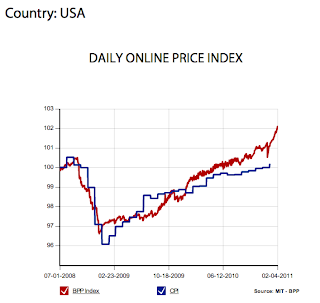 MIT's Billion Prices Project attempts to measure inflation from a basket of prices scraped from the web. It seems to follow the CPI fairly well. Clearly, it seems to be predicting a big increase in CPI. Looking forward to seeing how accurate this is when January CPI comes out on February 17th.